Measure the supply voltage, current and frequency - you want to make sure all these are within expected limits. If any of the readings are more than 10% out of range, this indicates a problem. 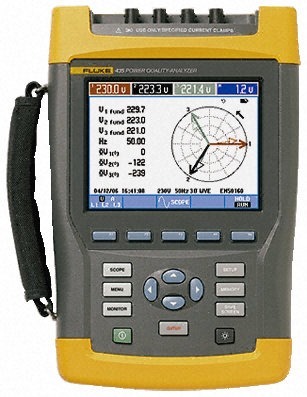 Check for phase unbalance - for three phase loads (i.e. motors), the system should be balanced; voltage unbalance of greater than 2% or current unbalance of greater than 6% would potentially indicate a problem. You can expect some unbalance for single phase loads the phase, however if this is excessive it may still indicate problems. Check for transients - these are more difficult to measure and will need some sort of recording instrument. Look for transients 50 V and more above nominal. You should measure for the duration in line with the observed symptoms. Check for voltage dip - look for dips 50 V and more below nominal. Again measure for the duration in line with the observed symptoms. Check the harmonics on the system - total harmonic distortion (THD) of greater than 6% could indicate problems. Check the power factor - this should be inline with expectations. The above should provide a fair indication that everything is ok with the supply. If the supply looks good, you can then start investigating potential problems with the equipment itself. In special cases, the power system parameters are more strictly defined (i.e. the CBEMA Information Technology Curve). Where applicable, you should be looking to ensure the supply parameters are within the specification. If you have any additional tips or suggestions on how to ensure the power supply is up to scratch, feel free to add them below. Periodic Electrical Installation Inspection – How Often?